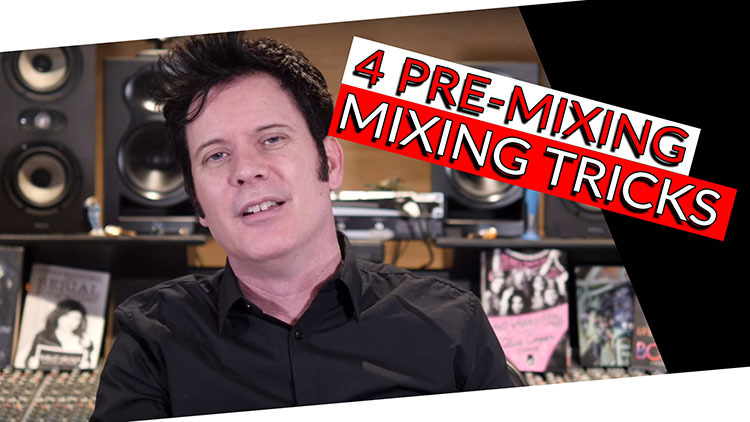 Today we’re going to talk about 4 mix tips that have nothing to do with plugins or any hardware. Tip 1: Are your tracks ready to mix? You may have the world’s greatest hit song on your hands- it might be the most beautifully written song. Sometimes a song is so good that it can look past the production and recording, however with today’s expectations that, unfortunately is fairly infrequent. These days people expect to hear something coming out of the radio that is really hook-laden, pretty concussive and that just smashes you over the head. Whether it is rock, pop, or EDM, we expect a lot of production value these days. Rapidly expanding technology has increased accessibility and the perceived ease of recording, we want it to be amazing and we want now! We no longer have to spend thousands of dollars huge recording studio. However, what came with spending thousands in the studio was a certain level of professionalism. You paid an engineer to record a guitar for instance and it was his job with the producer to not only ensure it was recorded really well but it was really in tune and just worked in the track, complimenting the song and it’s arrangement. If you’re starting to mix some tracks and the guitar is horribly out of tune you could spend hours with Melodyne trying to fix it. If it’s really super boomy and there’s no high end or mid range articulation, you could spend hours trying different multi bands and dynamic EQ and all kinds of stuff. But if it’s your production why not just re-record it? We spend a lot of time fixing. Sometimes it is a lot easier to just replay it. So are your tracks ready to mix? Are they good enough to mix? Take a deep breath, step back and just listen to it and if there are issues that you’re going to take you down into a rabbit hole for 2 hours trying to fix, when re-tracking them would be a better solution! You’ll probably have a greater understanding of what makes the song better still! Not everything is fixable with a plugin and secondly, it doesn’t always sound that good even after it’s been fixed! If a singer is 3 tones away from the note that you want- to pitch them up there is going to sound weird no matter what wonderful software you use. If you can spend a little extra time and fix the vocal or guitar part, you can improve the performance, tuning or the way it was recorded, because if it’s too boomy, badly compressed or too distorted it’s going to be really hard to undo that. I recently had this same situation, I was given a string sections to mix and there was nothing above 4K. So we were boosting the high-end like crazy trying to get some air around there but it just wasn’t there. The easiest solution would be to just re-record it. So are your tracks ready to mix? Are they good enough to mix? We are all aware that panning has a huge impact on our mix! Think about where the vocal or instrument is going to appear when you panning it. Whether it’s going to be left or right; is it going to be 100% left or 100% right when the stereo guitars come in or is it going to go slap down the middle? These are all things that we think about, maybe 50/50 in the verses and then full Left and Right to create maximum width in the choruses. Something else I’ve been talking about for years is front to back dimensions. One of the skills of the great engineers, the guys and girls who we grew up listening to and loving, was a recording with a certain amount of room tone in it. They weren’t sticking an acoustic guitar player in an anechoic chamber so it was so dead and perfect and then adding reverb. They were capturing the sound of an instrument in a room, why is that? Well, it sits beautifully in a mix, you can spend your whole life with dry virtual instruments trying to dial in 50 different types of reverbs and delays. Part of the process can be recording it where you want to hear it. Recording an acoustic guitar in a room is rather wonderful- close mic it, far mic it, or maybe half mic it! These are things to think about mixing. It isn’t just left, right, center, 50/50. These are all wonderful tricks we use when panning, but you can also think front to back. Do you want something really forward or do you want something really back? This isn’t all about the mix. This can be recorded the way that you want to hear it. It’s a lot easier than you think. If every instrument you record is completely flat then you’re going to have a lot of work ahead of you trying to dial in a lot of different room tones and delays just trying to create some space between the front and back. One of the things we face a lot these days is mixes that are so heavily limited and so bright that everything is forward and there doesn’t seem to be anything back. It’s just a full frontal assault to your ears! So think about recording, mixing, and dimensions front to back as well as left and right. I hope you’re enjoying these tips please leave your tips on our youtube comment section! 85db as we know is the industry standard. It is basically where you hear everything flat, so for instance you’ll hear 60hz and 10k evenly. Also, I will listen to it at lower levels. I’ll drop the levels to about half the volume, mark it on the monitor control and get used to being at a level you know and trust. If you find that you’re mixing above that then I’m telling you now that your mix will be so painfully bright the next day because your ears will turn themselves down. All the 3-5k and above will just get turned down, you’ll come in the next day and you won’t know what happened cause you burned your ears out. Mark the level that you work at and work at it consistently train yourself and your ears to always be listening at that level and you get to a great result quicker and quicker each time. Your ears are your number one tool. This should have been number 1,2,3 and 4! This is the most important thing: healthy ears are really, really important. I have been blessed that I have been doing this for my whole life, but because I’ve always mixed loud, mixed quiet, mixed loud, mixed in the middle, I have not done any damage to my hearing. I have also learned that when working legacy artist that may be little older and don’t quite have the hearing, I put in earplugs. When tracking guitars with certain heavy rock guitarists I wear earplugs, I get the tones up to where I want them to be and then I put in the earplugs and I start tracking. Protect your hearing, it is your number one tool, your most important thing and something you need to guard so heavily! You really need to look after your hearing. Get used to mixing at a level that makes sense and when your tweaking and listening to something for ages bring it down and get used to monitoring and hearing things at lower levels. In fact automation, in particular, is really easy and better to do at a lower level. You’ll hear all those little discrepancies a lot easier. Once things get super loud and everything seems to be in place, turn it down below 85db! So listen low, protect your hearing it’s your number one tool! What is Reverse Reverb? Should I Be Using It?